Hi Everyone, I hope you are well on your way with your festive preparations, I am just beginning to feel I am getting there and having attended my grandchildren’s school Christmas carol service at the church this week I am beginning to feel very Christmassy. I am really pleased to welcome Sara Emily today as one of our guest winners and just take a look at the amazing project she has made to share with us all. Hello, everybody! I’m Sara Emily (aka sarascloset), and I live in Southeastern North Carolina with my husband of 19 years and 16 year old boy/girl twins. I've loved vintage things since I was a teenager. When I stumbled on A Vintage Journey about a year ago, it was love at first sight. I had been kind of “stalking” the great works by the Creative Guides, but I knew nothing about blogging. I finally got on board and blogged my first entry to A Vintage Journey in June 2014, won my first Pinworthy mention in August, and there's been no turning back. 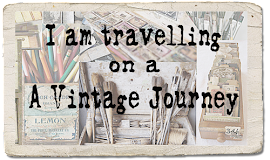 I am on a Vintage Journey for sure! I really have no idea how to define my style, but it is certainly NOT frilly! Vintage/ Eclectic at best! 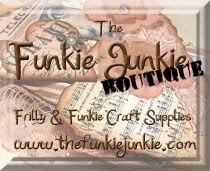 I am thrilled and honored to be asked to be a Guest Creative Guide here at A Vintage Journey today! Well, let’s get started! For Challenge #21, Sandy says "Let's Celebrate!" You can make something to celebrate Christmas, Hanukkah, New Years or a December birthday or anniversary. I chose to make myself something for Christmas. When I think of Tim Holtz and Christmas, I cannot help but envision Shiny Bright vintage Christmas ornaments! I have been collecting these beautifully decorated glass globes of goodness since, at 15 years of age, I was given two boxes of these vintage ornaments by my stepfather, Earl. They were his mothers, so they are really old. I stopped decorating my tree with the oldest and dearest glass ornaments when I got my two kittens, but I take them out at each year and put them in glass bowls in the china cabinet. I’ve collected quite a few over the years, and I’m running out of space to display them! Suffice it to say, my project was inspired by not only my and Tim’s love of vintage ornaments, but by his techniques and color palette. Specifically, Tim’s CHA Summer show 2013 was the true inspiration behind this wall hanging, made with his Configurations box. I chose to use a more neutral color palette for the box exterior hopefully mimicking an old wooden frame (and not-so-coincidentally matches a huge vintage plate rack I refinished and where I place all my tiniest vintage finds). I used one of Tim’s On the Edge dies to make the top and bottom ornate additions. A variety of Distress Paints and Crackle Paint followed by more Distress Paints make this wood grain effect. I wanted to keep it neutral instead of a Christmas-y palette, so I could use this year round. I can simply take off the top of the box and put it on another base to fit the season. I also used removable adhesive pop dots to secure my ornaments and snowflakes so I can remove them and change out with others each year. This also allows me to remove my precious ornaments and store them in their original Shiny Bright boxes for safe keeping. My background paper for the larger part of the box and exterior of the tiny boxes is comprised of copies of vintage Post Cereal promotional (“Collect all 6!” Sadly, I only have 3!) pop out and assemble Christmas ornaments. The paper inside each of the tiny boxes is from Tim’s Seasonal 8 x 8 paper stash—just perfect for these little “rooms”. I hope my wall hanging inspires you to get grungy, “celebrate” all that is vintage, and join in the fun this time at A Vintage Journey! Please pop over to my blog for more details and loads more photos! Merry Christmas! Thank you Sara for creating this wonderful configurations box hanging. I love the die-cut top and bottom ornate edges and how you have filled it with fabulous vintage bits and pieces. It is a beautifully festive make for our ‘Let’s Celebrate’ challenge. So onto our winner’s section and Chris had the pleasure of making the final decisions of who the winner is today and the pinworthy mentions from the ‘Birds of a feather’ challenge.
" A gorgeous canvas album with a beautiful birdie in prime place on the front. Using Tim's techniques to decorate and embellish, this vintage styled album simply stood out to me. A fabulous example of 'clean' shabby/vintage - a great make Stephanie! " Stephanie your lovely project will be added to our Winner's board and your badge and voucher will be on their way to you soon.
" A stunning tag featuring Tim techniques and products. This festive tag looks good enough to eat. Lots of interest, great colours and fab texturing. Well done Evelyn! " " This wonderful, distressed, metallic work of art mixes contemporary with vintage for a wonderful shabby chic look. A gorgeous original make, well done Kreatussa! " " Monica has ventured outside of her normal crafting field into something entirely different and this is the result. She has taken the essence of Tim with believing in yourself and expressing it and that struck me as probably one of his biggest influences on so many of us! Great work Monica, keep it up! " Please don’t forget to take a look at our Secret Santa and Giveaway post, everyone who takes part and follows the rules will be in with a chance of winning our first Giveaway prize and if we get more people joining we add other prizes to the list. This is our first prize. There are some fabulous Tim dies, a small canvas and round boxes for altering, distress inks, brads, ephemera, tissue tape and a real VINTAGE Charlotte Doll actually mined in Germany from an old factory. It is made of porcelain and is similar to Tim’s fractured dolls. Don’t forget this closes at the end of Sunday GMT time. There’s one most post before the big day arrives, so we will see you on Monday with an amazing guest designer sharing another fabulous project with you. What a wonderful little cabinet you created Sara! I love the wood surface you created on Tim's cabinet Box - and all the wonderful little craftys and antiques in each sectiont - what a lovely way to show them off and keep them on display! Thanks so much for being our Guest Designer! And congrats to the winner Stephanie - and the pinworthies Evelyn, Kreatusa and Monica! Congratulations Stephanie! Love your beautiful canvas album with that sweet birdie! Congratulations to all of the Pinworthies...very well done work! Thank you Brenda and the Creative Guides, for allowing me the privilege to be a Guest Creative Guide for the day! Hugs! Beautiful project Sara, that vintage look is right up our alley. Welcome!! Love your project Sara, full of amazing vintage goodness, and very much "Tim"!! Big congrats to our winner and pinworthies, fabulous projects from you all!! Congrats Stephanie! Have not tried a canvas album as of yet, but may have to give it a try. Honored to be chosen as pinworthy. Thanks for all the inspiration. What a beautiful way to display your treasured glass baubles Sara! I love that you've made the frame match an existing one and how you've decorated each 'room' to compliment the look of the baubles. Huge congratulations again on your worthy November win. Sara, your vintage display is absolutely gorgeous and just brimming with vintage goodness! Your treatment of the frame is superb and those little glass baubles are delightful! I actually came to you via Sara's lovely blog! I go there often to be refreshed and inspired. Her work is like an oasis...and this lovely little altered cabinet is so typical of her amazing creations! 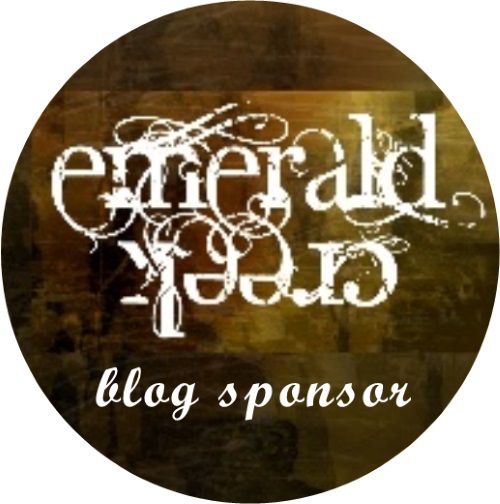 I'm so glad you featured her here...and glad to be adding your blog to my reader. More inspiration! Hooray! Merry Christmas! Beautiful nostalgic project Sara and lucky you having these vintage baubles. Love the way you have displayed them and it's lovely to learn a little more about you. Thanks for being our GD. Thank you so much for voting my tag into the pinworthies! Congrats to the winner Stephanie and the other pinworthies, beautiful work! The cabinet of Sara is awesome, I love the vintage mood and all the pretty tiny rooms. Oh wow, I won?! I'm so excited. Thank you so much and thank you all for your sweet comments and congrats here!!! A big congrats to all the other pinworthies! What a fantastic decorative piece from Sara - a glorious way to put those vintage baubles centre stage. Brilliant! Congrats to Stephanie and the Pinworthies - lovely work from everyone.